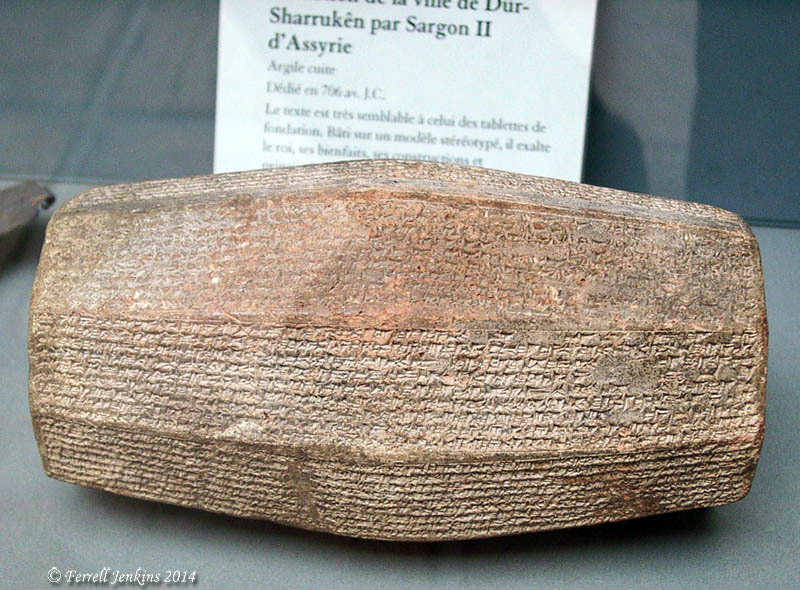 For many years there was no reference to Sargon II (722-705 B.C.) in the available Assyrian records. Yet, the prophet Isaiah, writing at the time of the Assyrian captivity of the northern kingdom of Israel, mentions Sargon’s campaign against Ashdod. The palace of Sargon was discovered by Emile Botta at Khorsabad in 1843. This was the period of “monumental” discoveries in archaeology. Both the British Museum and the Louvre have impressive artifacts from the palace of Sargon. 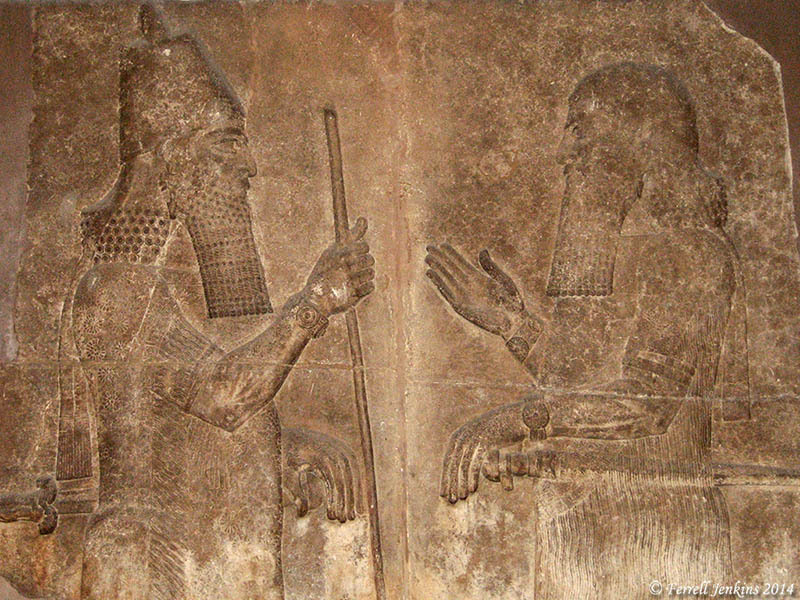 The photo below shows Sargon (on the left) receiving one of his ministers. Sargon II receives a minister. British Museum. Photo by Ferrell Jenkins. D. J. Wiseman explains the historical context of what happened at Ashdod. One hundred twenty years after the discovery of Sargon’s palace, archaeologists working at Ashdod discovered fragments of a cuneiform stele of Sargon II at Ashdod. For more information about the discovery and a photograph of it see “Sargon II, Ashdod, and Isaiah 20:1” here. This inscription tells of the building of Sargon’s palace. Louvre. Photo by Ferrell Jenkins. This entry was posted in Archaeology, Bible Places, Bible Study, Israel, Old Testament, Photography, Travel and tagged Ashdod, Assyrian Empire, Isaiah. Bookmark the permalink. I know I’m commenting on this late, and I apologise for that. One thing that really struck me about Isaiah’s mention of Sargon is that none of the ancient historians mentioned Sargon — he, like Belshazzar in Daniel, was completely forgotten within 100 years of his death. His son, Sennacherib, left him out of his annals and monuments. He simply disappeared beneath Iraqi sands, and no one remembered him. It seems, then, that Isaiah’s mention of Sargon is strong evidence that Isaiah was writing as a near chronological contemporary of Sargon — or how would he have even known of Sargon? That obviously fits with the Biblical account. And it has significant ramifications for how we view Isaiah’s prophecies, and is problematic for those sceptics who argue for a later date.